What's the Deal with North Korean Airspace? If you use a flight tracker to view live air traffic (such as flightradar24) or another type of map outlining flights across the world, it can seem a bit congested. 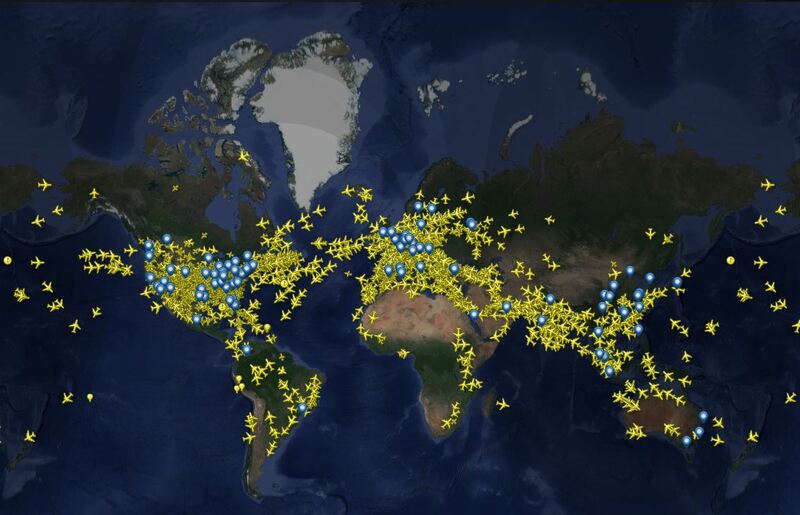 With some exceptions , it appears that airplanes either touch (or at the very least cross over) almost the entire world. The blue markers indicate major airports. Disclaimer from Flightradar24: "Please note that coverage and aircraft visibility is dependent of many parameters including aircraft type, aircraft transponder type, aircraft altitude and terrain, so coverage can be different for different aircraft, even on the same location." So while it's perhaps not perfect, the information presented is accurate, at least in understanding the berth of aviation coverage across the globe. There are a number of reasons why an aircraft might avoid a particular airspace, although usually it's for safety concerns. Temporary reasons for airspace avoidance include stadiums/sporting events, weather conditions, and wildfires. Airspace can be uncontrolled, controlled, restricted, or prohibited. Uncontrolled airspace is airspace where Air Traffic Control (ATC) service is either considered unnecessary or cannot be provided for practical reasons. Of ICAO's airspace classes, both class F and class G are uncontrolled. Controlled airspace is opposite of uncontrolled and is classes A to E. Controlled airspace is typically established for 3 reasons: high-volume air traffic areas; IFR traffic under ATC guidance; security. Restricted airspace is an area (typically) used by military where controlling authorities determined air traffic must be restricted (if not continually prohibited) for safety or security concerns. Prohibited airspace is an area where aircraft flight is not allowed--usually due to security. It's different from restricted airspace in that entry is typically forbidden at all times from all aircraft and is not subject to clearance from ATC or the airspace's controlling body. Groom Lake, also known as "Area 15" is a famous example of a permanently prohibited "no-fly zone" area within the United States. North Korea is known for being one of the most mysterious places in the world. Most avoid the country--and airlines are no exception. In the late 1990s, North Korea began making attempts at normalizing relations with the Western world. These attempts include opening North Korean airspace to international commercial flights in 1997. Still, the country is extremely isolated, and flights over N. Korea are infrequent--and in some cases restricted. The Federal Aviation Administration has prohibited U.S. air carriers or commercial operators from using N. Korean airspace almost since the time airspace was first opened in 1997. Initially, U.S. carriers couldn't fly over the area because the Office of Foreign Assets Control prohibited payment of the "overflight fees." On April 7, OFAC lifted that restriction, but less than 2 weeks later, the FAA issued Special Federal Aviation Regulation number 79 (SFAR 79), which took action to "prohibit certain flight operations within DPRK airspace." N. Korean airspace includes and expands beyond the land borders of the country to also include a portion of the Sea of japan and a small region above the Yellow Sea (West Sea). This section of airspace is called the Pyongyang FIR (flight information region). The FAA cites safety concerns for this airspace prohibition--specifically N. Korea's unannounced ballistic missile test launches into Sea of Japan, which continue today. Unannounced ballistic missile launches pose a potential hazard to U.S. civil aviation operations, which includes flights operating on air routes B467 and G711. Additional unannounced North Korean ballistic missile launches which may travel beyond the eastern boundary of SFAR 79 into the Pyongyang FIR (ZKKP) are possible, particularly during periods of heightened political tension, military training exercises, and/or significant North Korean national anniversary dates. U.S. operators are advised to use caution when planning to operate in or near the Pyongyang (ZKKP) FIR east of 132 degrees east longitude. Not everyone avoids N. Korean airspace to the extent of the United States. Several European airlines (such as Lufthansa, Air France, Turkish Airlines, KLM and Finnair) use a portion of airspace (including western side of the 132 degrees East latitude line, which the FAA has said is too dangerous for U.S. carriers). These flights are between Europe and the central and west Japan cities of Nagoya and Osaka (Kansai International Airport). South Korea airlines completely avoid North Korean airspace. China Southern Airlines offers a flight between Tokyo's Narita and Shenyang that flies directly over the country, crossing close to Pyongyang. This same flight path roughly follows the same flight path as N. Korea missile test firings. In fact, on March 4, 2014, A China Southern Airlines airplane carrying 220 passengers passed through the trajectory of a rocket launched only 7 minutes earlier by North Korea.